I love adding music and a few carefully chosen sound effects to a piece of recorded audio to ramp up the drama and play big in the theatre of the mind. My love of audio and appreciation of the powerful emotions that sound can evoke goes back to childhood. Radio plays always fascinated me growing up. Not just the story but the craft of the storytelling and how voices, music and effects all came together to create something truly brilliant. My curiosity was piqued further when I discovered the BBC had a department dedicated to the creation of those little audio effects that added so much to the experience. The BBC Sound Archive. The archive was not just dogs barking or shattering glass. It was a store for all the sound output of the BBC. Almost one hundred years of audio memories. Imagine my delight then, some time later, when I discovered that the BBC had issued many of the sound effects on albums, and called this jolly collection of audio bits & pieces the BBC Sound Effects Library. I think it was H & R Cloake at the entrance of the St George’s Walk precinct in Croydon were I first discovered the BBC’s collection of sound effect albums. Cloakes was a treasure trove for record collectors and, it turns out, sound effect aficionados. I’ve no idea how many sounds were to be found in the actual BBC Sound Archive or how many discs of extracts were published by the beeb but I must of had around thirty volumes of them. Thirty cherished vinyl albums in pristine cardboard sleeves that covered a mad range of human, animal, musical and mechanically generated sounds. The record collection spanned all the typical categories of sound you might expect: cars, birds, aircraft, sports etc. 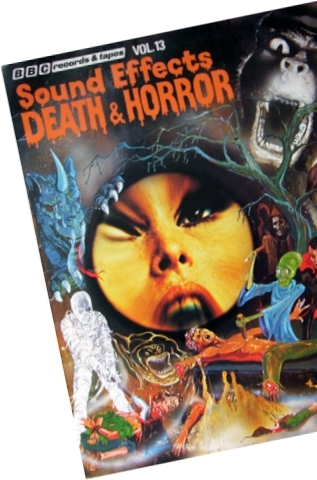 But it also featured more offbeat collections of effects and foley sounds. A favourite was the “Death & Horror” album. The sound cues included such delights as “Execution & Torture”, “Creaking Doors & Grave Digging”, “Heart attack”, “Head chopped off” and my absolute fave, “Red hot poker in eye”. This last effect, we are informed in the album notes, was achieved by plunging a hot metal rod into some juicy fruit. Can you imagine being a BBC producer and being asked to create such sounds as someone being garrotted, drowned, whipped or having their limbs dismembered. What a macbre yet magical job that must have been! Some years ago, after I had disposed of all the vinyl, I had a major splurge and bought the entire library on harddrive. It’s a mammoth collection of thousands of sound effects and historic recordings. I use it everyday when creating adverts, soundscapes or just dabbling with clips and sound bites. I'd love to dip into this vast resource and produce a memorable piece of audio for you. Contact me if you need some imaginative sound design or are seeking an elusive sound effect. Posted by Tim Longhurst on Mon 02 Jan 2017.